Technically, you can call the Flip Video Mino a camcorder. But its no-frills feature set and 640x480 resolution casts it as more of a 'dumbcorder'. Imagine the power of a VGA webcam sellotaped to a 2GB memory card, all stuffed into the hollowed out shell of a Nokia N95. So why would you want one? Because the Flip Video Mino is aimed squarely at a generation of video gawkers who like to share their life experience on YouTube, MySpace and Facebook. 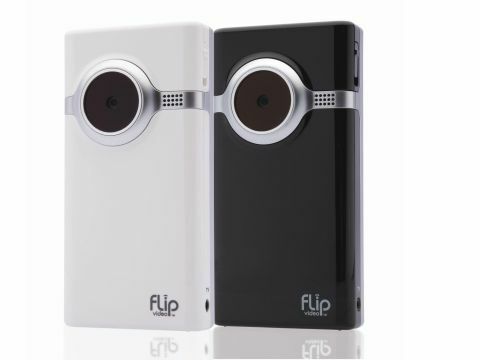 As result, the Flip Video Mino can't be too pricey or too difficult to master. So it's much like the previous Flip Video Ultra, which we praised for its "your-cat-could-use-it ease of operation". A power button on the right-hand side brings the Flip Video Mino to life. The start up is refreshingly quick (a second or two), after which it's a simple case of pointing and pressing the red record button to start shooting. With 2GB of memory on board, there's enough space to store 60 minutes of 640x480 resolution AVI video. The small number of controls reflect the minimalist (some might say 'idiot-proof') approach. You can view what you're shooting on a small 1.5-inch LCD, zooming in and out via the illuminated plus and minus buttons. You can then easily play back what you've recorded by using the left/right arrows to cycle through your clips. A slider-switch on the left-hand side ejects the built-in USB connector, enabling the Flip Video Mino to act just like an external flash drive. The internal memory contains a Flip Video application (for both PC and Mac) that offers basic video editing plus a video-sharing wizard to help you upload clips to the likes of AOL, YouTube and MySpace. On the plus side, the Flip Video Mino is small, lightweight and pocketable (but only just) and it's instant-on operation means you can be ready to shoot something in just a few seconds. Our expectations were low, but the video quality is decent enough for a VGA camera and the sound is surprisingly clear. Disadvantages? The memory isn't expandable, the 1.5-inch screen is too small and the Li-Ion rechargeable battery (giving you about four hours of battery life) isn't replaceable. But again, what do you expect for a simplistic camcorder with an RRP of £80? At least the Flip Video Mino is customisable. Swing by the Flip Video Store and you can choose to forgo the sober black model here in favour of a brightly-coloured casing. There's also a pattern generator so you can create unique designs, or you can upload your own image. Much like putting your face on a mug. Along with the excellent Creative Vado, the Flip Video Mino is helping to carve out a whole new sub-budget camcorder niche. With the emphasis on fun and ease-of-use rather than TV quality video, it feels almost like a throwaway device. The only nagging question is whether the Flip Video Mino has a longterm future when mobile phones are often including video capture as standard?